Coach is at 3 point line on wing at foul line extended. 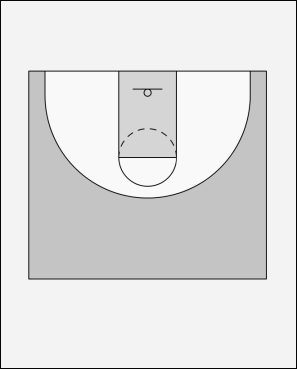 Players are between top of key and 1/2 court with a ball. Coach returns ball to player for catch and go. Run drill for 30 seconds after all 4 moves are complete move to other side of floor and repeat drill. If player misses layup rebounds missed shot and shoots until ball goes in basket. Same as 1 only catch and sweep before going to basket. Same as 1 except fake jump shot and go. Same as 1 except pivot on outside foot and go.